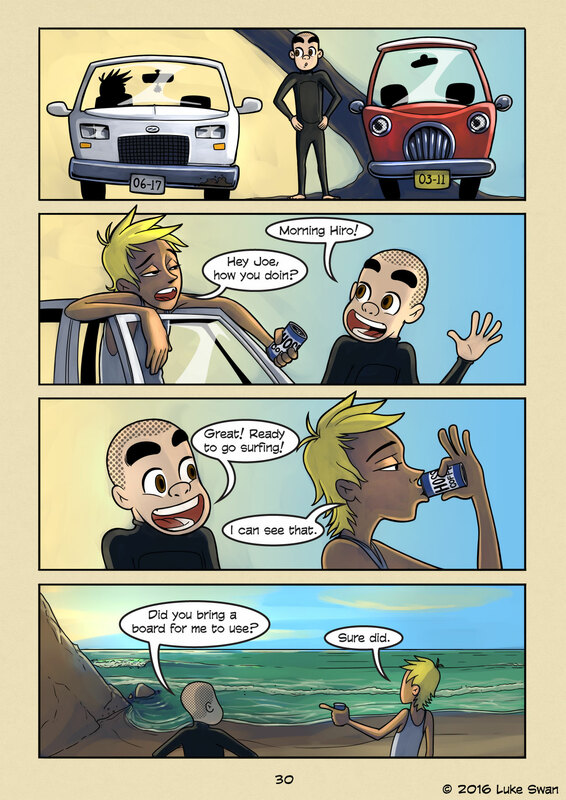 Borrowed Board (#030) | Web comic "Surfer Joe"
It’s pretty embarrassing when you forget your board. Seems like the silliest thing. I mean, how can anyone forget their surfboard? It’s like forgetting your parachute on a skydiving trip… maybe that’s too extreme. It’s like forgetting you ID at the liquor store? Bible at church? Doesn’t matter, the point is it’s a pretty stupid oversight for a surfer to make. But it happens. I forgotten my board at least twice, which oddly enough wasn’t as bad as the time I forgot my changing towel. What do you do when that happens? Hopefully you have a friend who is nice enough to let you borrow one of his boards. There’s not much alternative depending on how close you live to the beach. But I’d wager most guys don’t like riding loaners if they can help it. The first thing is that the board wasn’t made for you, so it might not match your volume needs. Also different board behave differently, and riding a loaner means you have to learn a new board. This can take a few sessions, and since you aren’t likely to ride the same board again it can seem a little pointless. Surfers develop relationships with their boards. You learn their tendencies, how they paddle and control. You learn the kinds of waves your boards like. All of this is developed over time. And over time trust is built. So borrowing your mates board is like going on a date with his girl. It might be fun, but it’s probably not going anywhere, and something about it feels wrong. Apologies for the rushed looking page. I caught a pretty nasty head cold over the weekend and have been struggling to get work done. It’s pretty amazing how much it affects your skills. Particularly cognitive and decision making skills. I’m starting to feel a little better today, but now I have a back log of tasks to get to. Ugh!